With its fairytale turrets and a 15th-Century tower, Chateau Latour Laguens is surrounded by vineyards in a region steeped in European tradition. But this chateau, south-east of Bordeaux, is also at the cutting edge of Asia’s growing economic might. The staff who tend the vineyards and make the wine are still French, but this is now a Chinese-owned domain. It has been taken over by the Longhai group based in eastern China, which has created a subsidiary to run it called Chateau Latour-Laguens (Qingdao). The Chinese are developing a new taste for French wines these days. And in addition to buying them by the bottle or the case, the Chinese have also started buying the vineyards where their favourite Bordeaux vintages are produced. Chateau Latour-Laguens was the first estate in Bordeaux to be bought by Chinese investors three years ago, but at least five others are now also Chinese-owned. 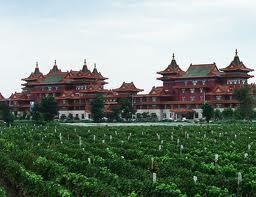 “We’re looking for the know-how, French technology and culture,” said Yilain Xu of Chateau Latour-Laguens (Qingdao). The new owners of Chateau Latour-Laguens have invested in the latest wine-making technology, and are renovating the chateau itself, which was somewhat run down before they took over. But they have been careful to keep the French workers, and have hired an experienced French oenologist, or expert in the science of winemaking, to manage the operation and improve the quality of the wine. But Chinese companies are not just investing here in Bordeaux, they are also developing winemaking in China, which is now the world’s seventh largest producer.